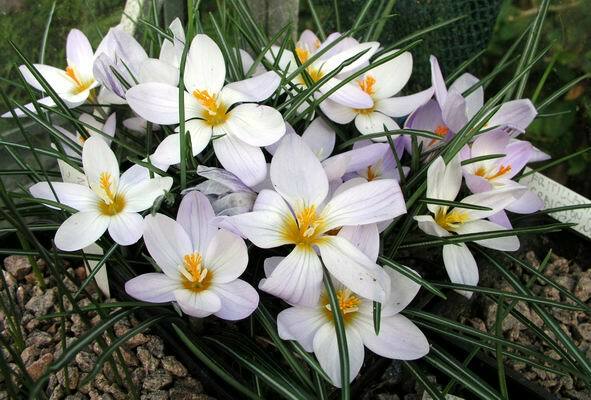 I just had to show you another picture of Crocus laevigatus this time it is in full flower and looking very nice on a late Autumn day. 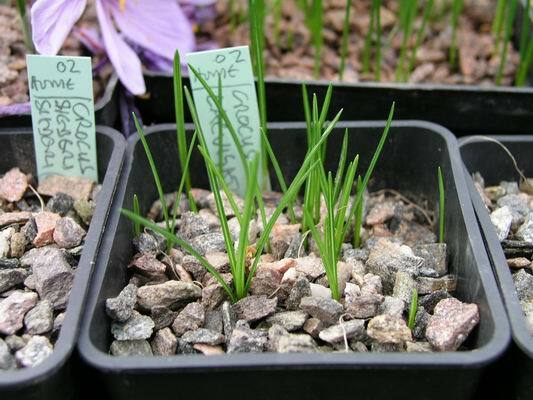 I am always banging on about that the best time for sowing many types of bulb seed (Crocus,Fritillaria, Narcissus,Erythronium, etc) is in September and October and for all but the papery Fritillaria type of seed I recommend sowing deep (2 to 3cms at least) well here is some more evidence to back my method. 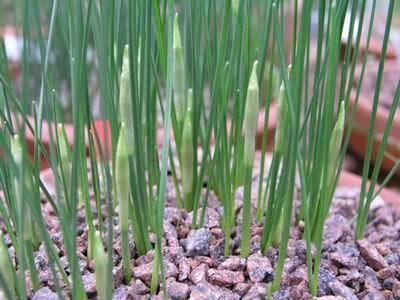 These are seedlings of Crocus laevigatus sown deeply last September (2002) - so this is them appearing for only their second year and I am sure that you will agree they look like strong leaves. I expect these to be in flower this time next year as I firmly believe that sowing at the correct time and at depth makes your bulbs grow and mature at least one year quicker. Bulb seed wants to germinate at the same time as a mature bulb of the same species is starting to make roots, this is the built in time clock that plants have and this is what I call the 'time window' where you can expect best results. Seeds sown outside their time window will still germinate but they may take a year to do so ( they are waiting until their time window comes around again). 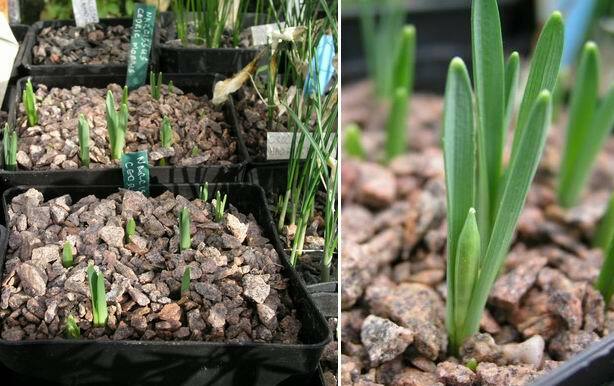 Surface sown seedling bulbs have to move themselves down into the compost which takes one or two years and they will not flower until the correct depth is reached. Some bulbous seed is just so frustrating and I find Tropaeolum azureum near the top of that list (equal to colchicum). The very first time I got seed of this beautiful plant was from John Watson in 1989, we received the seed in about February or March and we sowed it immediately - well it was up in two weeks ! Ever since then we have collected our own seed and have never managed to unlock the secret of a successful germination. Every year we will get one or two germinate even though we may sow a hundred. I have tried every trick I know or been told, chipping the seed, abrading it with sand, heat treatment, smoke, etc, etc. This year I did not collect all the seed from our plant and some fell into the sand plunge and now here is a seedling plant working its way up between the pots - is this the way forward, leave the seed in the plunge? I have thrown the seed we had left into the plunges to see what will happen. I have never had buds on our narcissus so early as this before, Narcissus 'Cedric Morris' does not usually show until mid to late December and it flowers towards the end of January. I know from growers further south that they often have it in flower for Christmas and it looks like ours will be out by then this year. This reinforces my theory that it is the temperature in the early autumn, when bulbs are starting to root, that controls when they will start to flower. 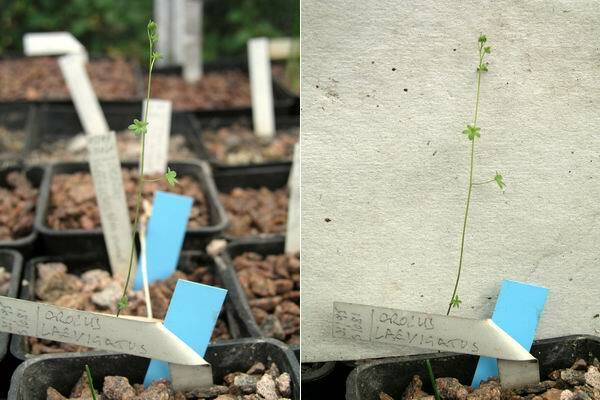 We have had a record-setting mild Autumn so we are having a record breaking early flowering. 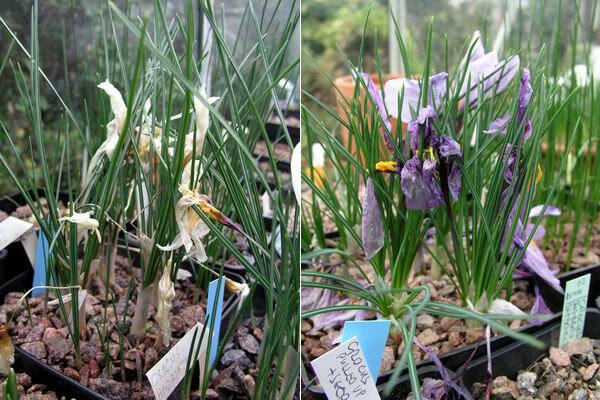 Most of the romieuxii type narcissus are now showing buds and these are extending daily. It is essential to make sure that they are receiving sufficient water and in this fine weather I am watering about every ten days. Remember that a good soaking is the best way, then allow the compost to almost dry out before repeating the soaking. As the winter approaches the period between waterings will become longer. 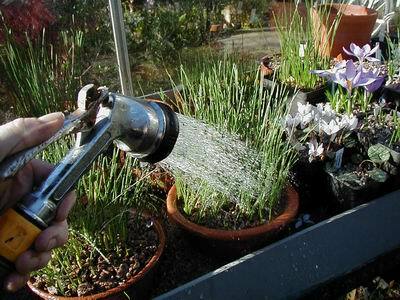 Often, when the temperatures are low, six weeks can pass without the need to water. A reminder to exercise good house keeping in the bulb house, this does not mean sweeping the floor, but constantly removing fading flowers which on cold still damp days can very quickly become mouldy. I find cyclamen especially susceptible as the flowers drop and the stems that have not been fertilised turn quickly into a soggy mess as you can see in the centre of this plant. 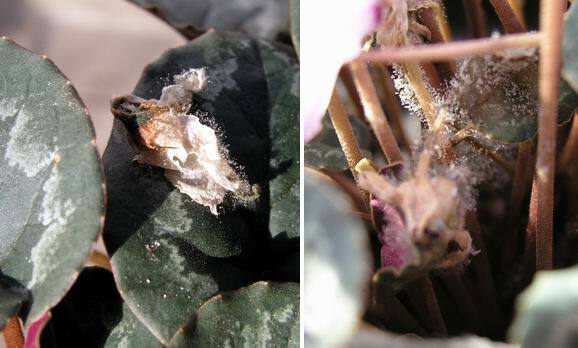 The botrytis that effects the fading flower can transfer onto the healthy leaves. 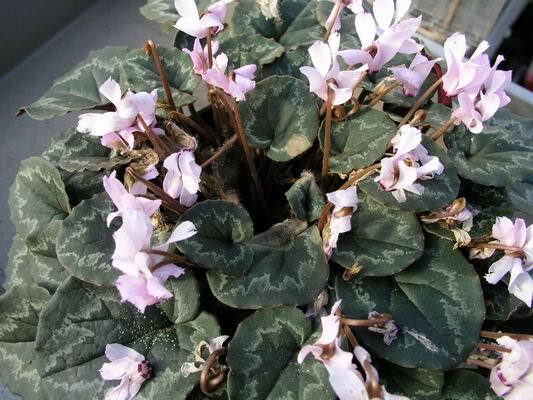 The way that cyclamen stems coil down to the corm transfers the botrytis to the heart of the plant and if you are not vigilant this can prove fatal to the plant. If you have an infected plant, like this one, remove all the infected leaves, stems and flowers and give it good dusting with flowers of sulphur. I am off on my travels this weekend and I will be speaking at the following AGS Groups. Friday 7 Nov. South Yorks. Group, Doncaster - 'Challenge of growing Bulbs' Saturday 8 Nov. West Yorkshire Group, Leeds - 'Erythroniums' Sunday 9 Nov. Chesterfield Group, Chesterfield - 'Bulbs in pots' Monday 10 Nov. East Lancs. Group, Ramsbottom - 'Propagation' If you read the Bulb log and are at one of these venues come up and say hello. 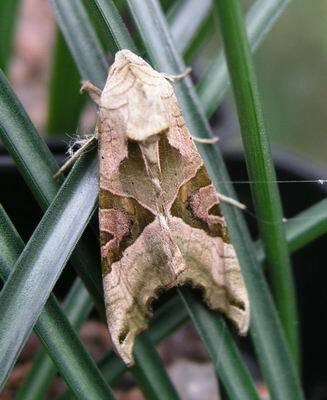 This moth has taken up residence on a sternbergia in the bulb house, any one know what type it is ?